A few months ago, during a consultation for a bad skin infection, my dermatologist advised me to use facial oils as my oily skin was actually dehydrated, and a well-formulated oil would actually help balance the skin. I spoke to Sandra of Cult Beauty and, with her guidance, selected some facial oils which my skin is now loving. I use them two times a day and they have not broken me out. Individual reviews will follow, but take a dekko at the list in the meantime. 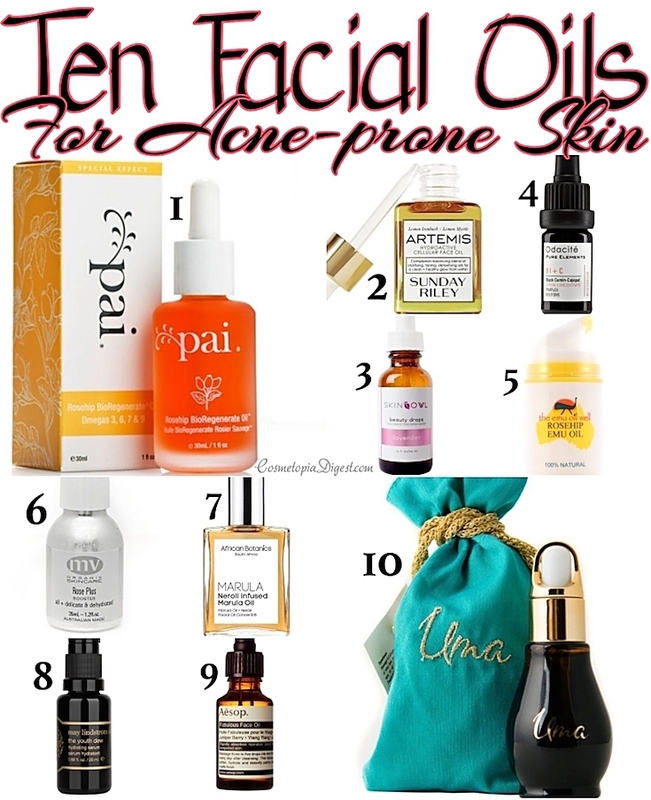 Scroll down for a look at the best 10 facial oils for acne-prone skin. Thoughts: Addicted to this orange miracle. You should use this just two times a week, at night. It helps reduce scars and pigmentation to a great extent. I bought two bottles, it's that good! Contains: Rosehip seed extract, Rosehip fruit extract (both rich in trans retinioc acids. Retinol, anyone? ), naturally occurring Vitamin E. Nothing else. Price: £22 for 30ml (1oz). Thoughts: I went through the Luna or Juno tug-of-war until Sandra told me Artemis was better for acne-prone skin because of the linoleic acid. I have only used it four or five times, irregularly - the others have to finish first. Detailed review after regular use. Contains: Pink Grapefruit, Pomegranate and Flaxseed oils, Black Cumin Seed and Milk Thistle Seed oils, Lemon Ironbark and Lemon Myrtle. Zilch else. Thoughts: Perfect for spot treatment. This was Sandra's second recommendation after Uma Oil. Founded by Annie Tevelin, who wanted a cure for her cystic acne. Contains: Organic Argania Spinosa extract, lavendar oil. Nowt else. Thoughts: I had my doubts about cumin and cajeput on the face, but it brings acne to a head quickly and ruptures or flattens pimples. Downside is, it comes only in 5ml bottles so I've been saving it for emergencies after a few uses. Contains: Virgin cold-pressed organic cumin and cajeput oils. GMO-free Vitamin E oil. That's it. Thoughts: Bought it recently after reading reviews about how it controlled breakouts. Check out the amazing price point! One use went well; will use more before I review. Contains: Sustainably produced emu oil, rosehip oil. Fin. Thoughts: Bought during Boxing Day sales. Lightweight enough to use below makeup. I love that this hydrates beautifully so I avoid moisturiser. More about my new routine soon. Contains: Essential oils of Rose Otto and Rose Geranium. Also, camellia, jojoba, rosehip and rosemary and non GM Vitamin E. End of. Thoughts: To be honest, I haven't bought this oil yet. It was out of stock when I went oil-hauling and now I'm on a ban now so it is on my must-buy list. Sandra said it was very good for acne-prone skin. I have Helen's review here to vouch for it. Contains: Marula and Neroli essential oils and natural fragrance. Thoughts: I did not buy this as a facial oil - I got a whole May Lindstrom set for Crimbo and have been adoring the brand. This is a light serum-oil for the mornings but I also use it on pampering evenings. Smells decadent. Contains: Loads of goodness. Avocado, Meadowfoam, Jojoba, Olive, Plum, Seabuckthorn, Rosehip, Pomegranate, Tamanu, Borage, Kukui Nut, Evening Primrose, Grapefruit, Geranium Rose, Sweet Orange, Lemon, Bulgarian Rose, Neroli and Carrot Seed Essential Oils. Also, Ubiquinone - Coenzyme Q10 (naturally occurring antioxidant coenzyme). Thoughts: Another I haven't tested out properly - I only have a sample version. Will let you know how it goes. Here's Helen's review of this on Lola's Secret Beauty Blog so you can see how it works. She has reviewed a whole gamut of luxury oils and is the expert on not just facial oils, but also luxury body, hair and cleansing oils! Contains: Sweet almond, camellia, evening primrose, wheat germ, hazel, macadamia, jasmine, Cananga Odorata Flower and Juniper essential oils. Also contains Vitamin E, Linalool, Benzyl Benzoate, Jasminum Officinate (Jasmine) Oil, Benzyl Salicylate, Geraniol, Farnesol, Eugenol, and Benzyl Alcohol. Thoughts: My first-ever facial oil, bought right after I got the skin infection in early December. The brand's founders struggled with cystic acne right before their wedding and used this. Super-expensive and sponsored by my Dad in the hope that it would reduce the infection, after Sandra suggested it. It worked. Good to use every evening. Contains: A super-blend. In grapeseed oil base, you get essential oils of: Clove Tea Tree, Juniper Berry, Orange, Lavender, Geranium and Clary Sage. Nothing else in this dark glass bottle. Do you use a facial oil? Which is your favourite? Tell me in the Disqus comments widget below.